Join the Oxford Film Festival for a wine and cheese reception and live auction to benefit the Oxford Film Festival. 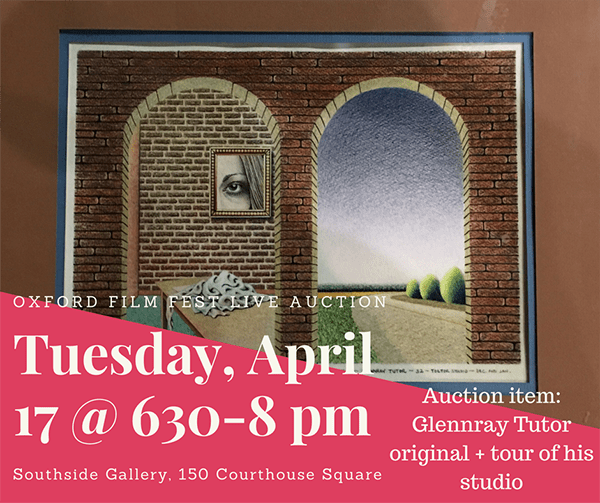 Live auction of Glennray Tutor original painting which includes a private tour of his studio on Tuesday, April 17 from 6:30-8 pm at Southside Gallery, 150 Courthouse Square, Oxford, Mississippi. This work was part of a private collection since 1982 and has been donated to the Oxford Film Festival. Valued by the Artist at $12,000 the work is titled “Two Rooms (Tickets)” and is acrylic on paper. The dimensions are 15×20 inches. Auction price only includes local delivery within Lafayette County. Winning bids that require shipping will be the responsibility of the purchaser. By completing this form the bidder recognizes that they are pledging to fulfill a donation to the Oxford Film Festival in exchange for the painting. If you can not attend we will be sending out texts during the auction with the opportunity for “call/text in bids” to support this project. A bid is not valid until received and accepted by the auctioneer. Oxford Film Festival is not responsible for any technical issues related to the text bid process but offers this courtesy to supporter and art patrons who are unable to attend the event. If you are unable to attend the auction in person, please know that we will accept bids via text message. See the link below on how to take part.